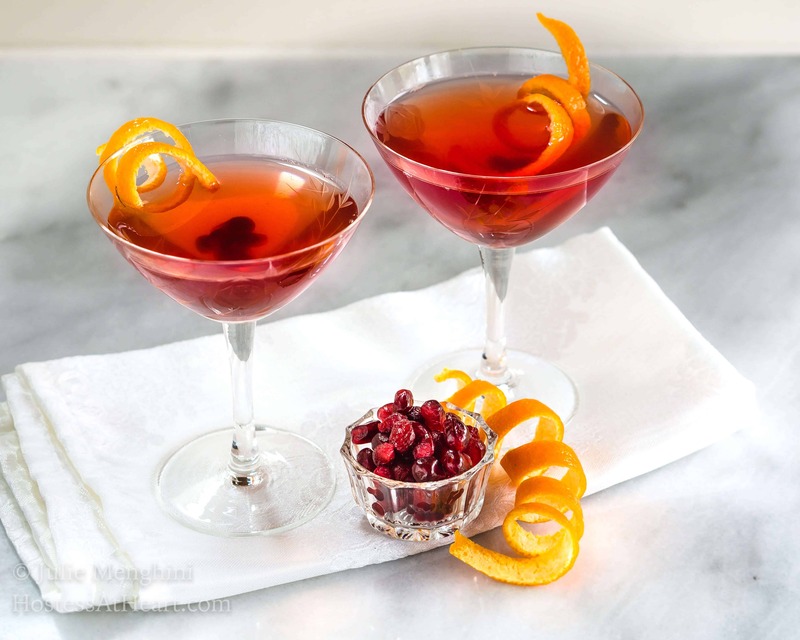 Easy Pomegranate Clementine Vodka Cocktail for a Toast! 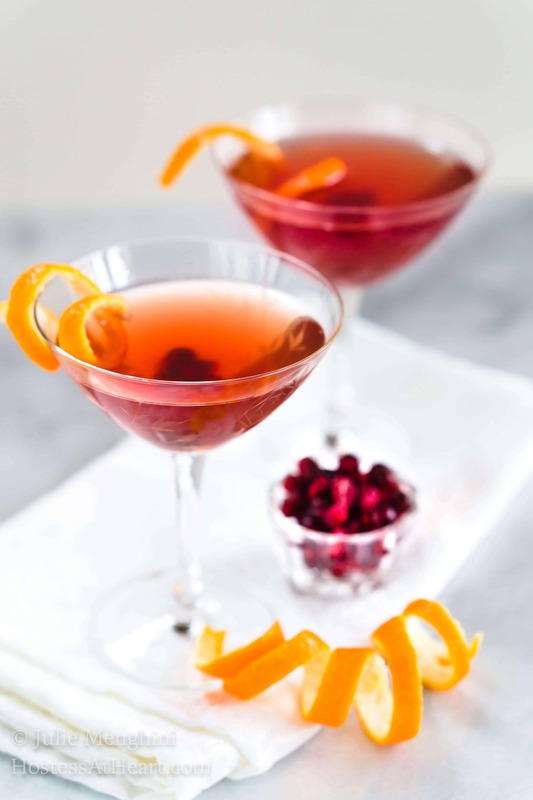 This Easy Pomegranate Clementine Vodka Cocktail Recipe is party ready. It’ll appeal to the boozy purest as well as the occasional sipper. Hello, this is Julie from Hostess At Heart! It’s time to start concentrating on New Year’s Eve., and what better place to celebrate than on Take Two Tapas? Everyone knows that Jennifer knows how to throw a party so this Pomegranate Clementine Vodka Cocktail will be right at home. New Year’s Eve. will be here before we know it and if you’re entertaining it doesn’t have to be complicated or a lot of work. All of your prep can be done right at the grocery store by putting a beautiful cheese board together before guests arrive. Jennifer’s Cheese Board Tutorial is perfect for winter entertaining. She’s also got a complete appetizer menu that’s a delicious resource too! I love having finger food too so my guests can help themselves. A Drunken Goat Cheese Log or Sriracha Black Pepper Pretzel Nuggets are easy to put together and would be perfect! When entertaining, the last thing you want to do is play bartender. 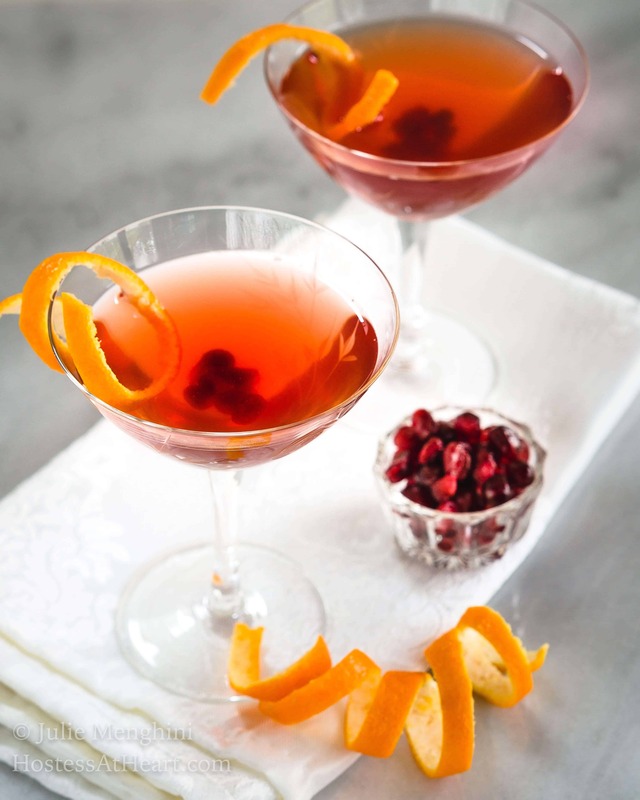 This Pomegranate Clementine Vodka Cocktail can be mixed together in advance and shaken with ice when you’re ready for it. Pomegranate juice is delicious and is a natural anti-inflammatory among so many other health benefits so I don’t mind having this juice leftover. I look for juice that isn’t from concentrate. Another thing that I learned the hard way is that too much pomegranate juice in this drink changes a delicious cocktail into something that tastes like cough syrup! Yuck! Muddle the clementine slice and powdered sugar together. Add remaining ingredients and stir with a couple of ice cubes. 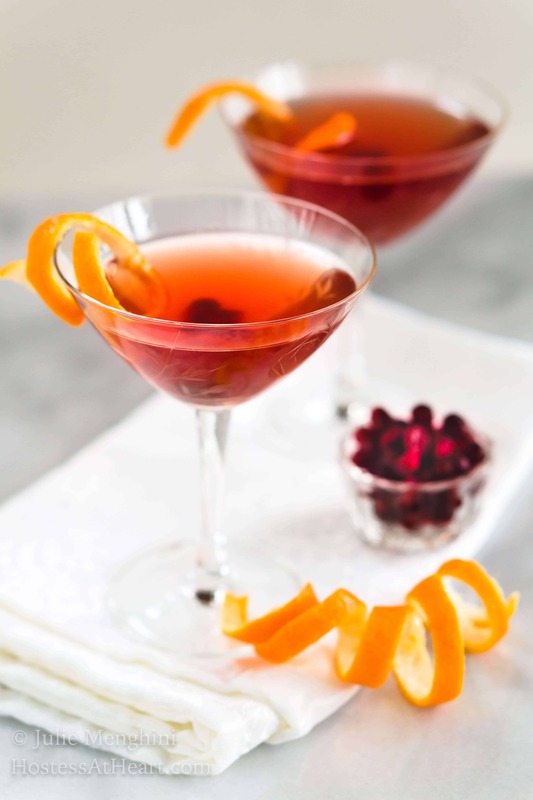 Strain into a coupe or martini glass and garnish with clementine ribbon. 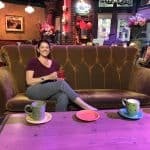 I want to thank Jennifer for allowing me to share my Pomegranate Clementine Vodka Cocktail with her friends. If you still need a couple beverages to add to your entertaining, her Penitent Punch, Blackberry Coconut Splash, or her Pink Passion Party Punch. I’m hoping to make this one for Valentine’s day too! This is totally my kind of drink, I can’t wait to try it!